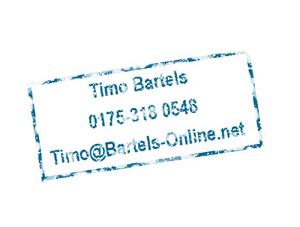 The owner of this website and the owner of all copyrights used on this website is Timo Bartels. No parts of this website (including design, code, images and photographs) may be reproduced, distributed, republished, broadcasted, hyperlinked or transmitted in any manner or by any means without the written approval of the copyright owner. You may not mirror any material used on this website on any other server without the approval of Timo Bartels. All photographs shown on this website are copyright protected by Timo Bartels. Webdesign & content of this website have been developed and is being maintained by Timo Bartels. Responsible for the content of this website is Timo Bartels.I do not assume liability for the content of external links. Responsible for the content of external links are the operators of these websites.